If you've been a follower of this site for a while you know one of the big parts of the site are all the cleaning and laundry product reviews I've got that are written by readers, just like you. Overall I am so very proud of these reviews, and spend a lot of time adding them to the site, because I think they are a huge unbiased help to everyone to find products that work, versus which ones don't. But every once in a while I run into a complaint about a product that I find unfounded, so I try in comments or in other commentary to explain why what that particular person has complained about should be taken with a grain of salt. And here's one that I have gotten over and over about _______ (fill in the blank) brand of laundry detergent. The complaint is -- this product is horrible because it doesn't suds. There are many reasons why a detergent might be a huge disappointment, and I agree some of them are pretty horrible and I would not use them. But let's complain about something that truly makes a difference instead of the amount of suds. So I'm going to let you in on a secret. The amount of suds that are made by a laundry detergent have absolutely NOTHING to do with the cleaning power of that product. From a scientific perspective it is important to state, from the get go, that there is a difference between a "soap" and a "detergent." For soaps, the amount of suds DOES make a difference in its cleaning power. However, this is NOT the case for detergents. That being said, a long time ago when laundry detergents (versus laundry soaps) first came out marketers wanted to prove their products worked well. So they perpetuated the myth that suds were necessary for detergents, and showed they were working, just like is the case for soaps. That marketing ploy eventually turned into a commonly held belief amongst people that no suds = horrible detergent. Unfortunately for laundry detergent manufacturers their marketing ploy has now come back to bite them in the backside amongst many consumers. which use significantly less water then the older washer models. Further, even if you don't personally own a high-efficiency machine chances are the detergent you're purchasing these days is called "dual use," meaning they can be used either in a traditional or HE machine. The reason manufacturers are making dual use detergent is that it is easier to create one product that works for both types of machines then having to have separate lines depending on the machine you use. That means that everyone is seeing less suds in their laundry detergent when they pour a bit into the machine then they were years ago. I can tell just from all the complaints I've personally received from readers that they are noticing this lack of suds and many have formed bad impressions of the detergent they tried for this very reason. Or, they've wasted quite a bit of the detergent pouring more and more in trying to make suds because that is what they expect to happen, and believe the clothes cannot get clean without them. But for the reasons I've already explained this criticism is completely unfair! So here's my public service announcement to everyone. Do not conclude, based on lack of suds, that a detergent is sub-par. Instead, give it a go despite not seeing bubbles when you add it to your machine. Try it, with the amount recommended for use, and not extra which is a waste of money and can cause detergent residue to stay in your clothes (which itself can make your clothes feel dirty and yucky) and make a decision about whether you like it based on other criteria. If it doesn't remove stains, makes you itch, leaves a yucky smell behind, doesn't actually clean soil, etc. then that still is not a good detergent. But lack of bubbles shouldn't be something you consider, either way. Oh, and if you want to check out all the laundry detergent reviews on the site you can do so here. At last count I've got over 130 pages of reviews of just about every brand and type imaginable! Most people are under the impression that suds or bubbles means cleaning power. That is not true. In fact, if you are seeing suds your clothes are probably holding on to soap residue. Manufacturers recommend the correct amount of their product based on testing, not suds. Save yourself money and use only what is recommended. That's what my washer manufacturer told me too! I was told by the company who made my washer, which is a front loader, that manufacturers have changed many of the laundry soaps so that you will not get anywhere near as many suds as they used to. This is especially true for the front loaders, which typically use HE detergent. 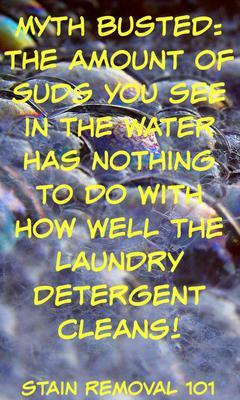 I find low suds detergent does not rinse as well. To see for yourself do a load as usual. Then start another cycle with the same load, but add a nylon mesh 'grocery bag' to the load. A light foam results and rinses well. question: did vinegar ruin my soap nuts liquid? I have been using soap nuts for nearly three years now, and love them. I both add them in little bags to the wash and also use frozen liquid cubes. About every six months I make a large batch of liquid and freeze it into ice cubes and add a couple of cubes to each load. I simmer the soap nuts for about 4 days in a big crock pot before freezing it into cubes. I have an High End Whirlpool washer so use He Tide in both the delicate and Orange regular. My problem is although I use very small amounts, like a quarter size I have to reset and reset the machine to get all of the soap out. How do I know that the soap is not all out? I have a laundry tub the water drains in to. I use less because I have a water softener. Any help for me.